what to do while the pope is here? what about a day of yard sales? So Pope Francis is coming to Philadelphia at the end of September. But what does that mean for us out here in Chester County? Other then no one can go near Philadelphia? So why not have a little fun out here? 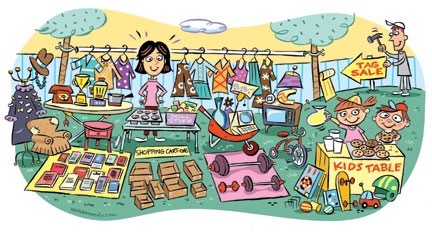 What if there was a countywide yard sale day on Saturday, September 26? Yes…Holy Yard Sale Day. Yesterday we took field trip. 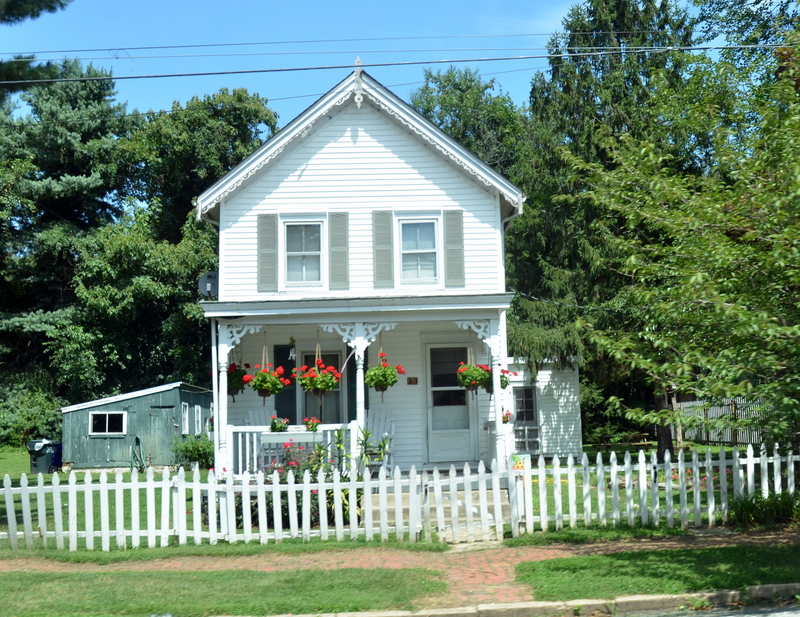 To Jake’s Flea Market in Barto, PA. 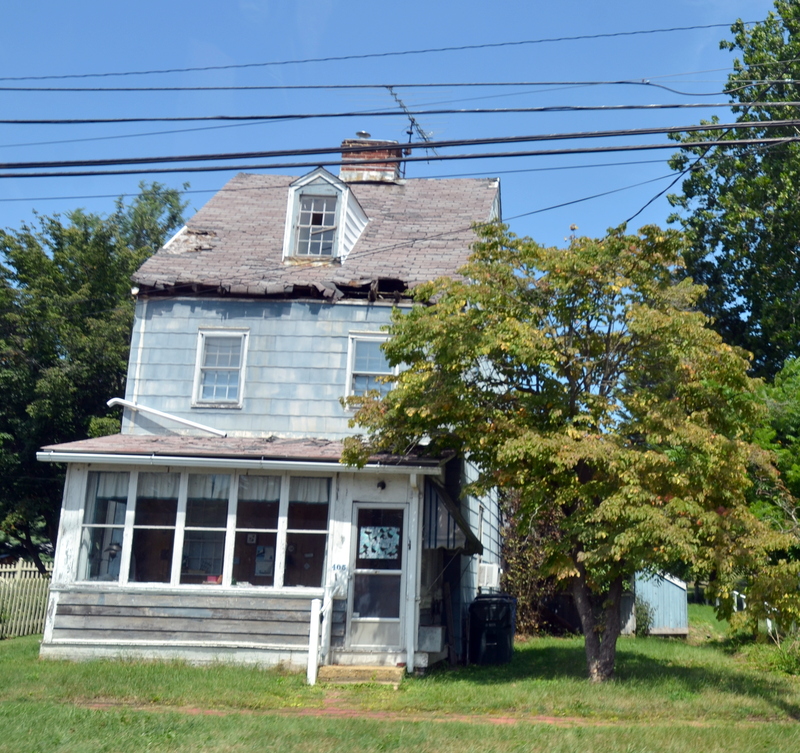 The address is 1380 Route 100, Barto PA. It is a straight shot up Route 100 above Pottstown but before Allentown. Blogs like Tour de Thrift have written up Jake’s before so I am not breaking new ground. It was a gorgeous day yesterday as we made our way up to Barto. We got to Jake’s a little late – after 10 AM at a lot of vendors were already gone. But there was still plenty to look at. Serious pickers I know have told me that if you’re not using a flashlight when you’re at Jake’s you’re not getting the best deal. Yes, the place opens at like 6 AM. I also was told Sundays are the better day. But I still had fun as there was a lot to look up. There was a vintage, antiques, collectibles, junk, you name it. And the prices were true flea market pricing, as in old-school pricing. It was nice to deal with vendors who liked to dicker which is so fun and part of the experience. I also bought a whole carload full of beautiful produce from local farmers for under $20. I got a pair of awesome older gardening shears that were perfectly sharpened for $4. I also got what you see photographed above. You know how I am about my Christmas decorations! 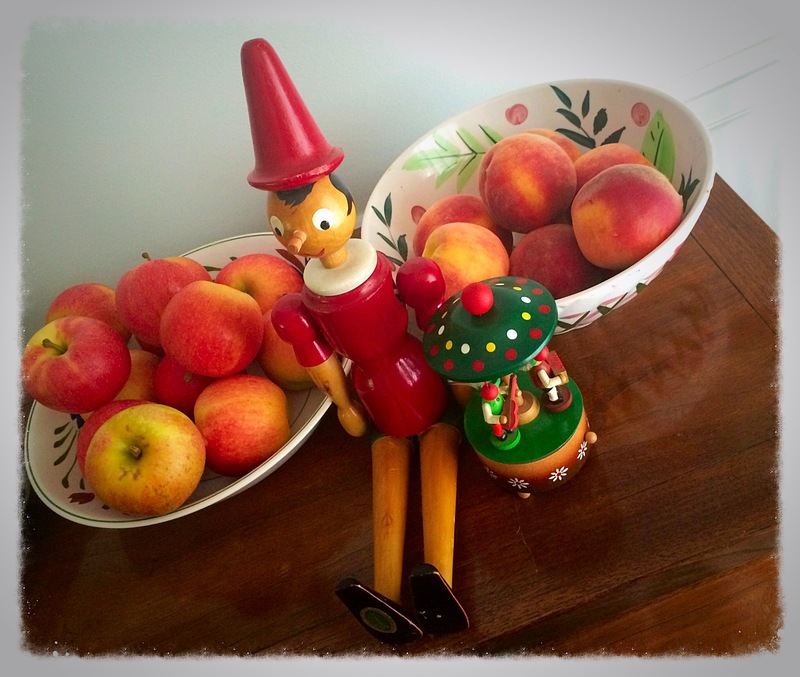 The vintage Pinocchio was made in Italy and disjointed and can sit up or stand. And next to Pinocchio is a little music box made in Germany. It plays silent night. I am pretty sure it is by Steibach, maybe Erzgebirge. It was $5. I also picked up an amazing perfect pair of carnival glass candlesticks that I swapped to another dealer I know for a crock I wanted! Next time I’m going really early! I had another friend who drove up this morning who scored some awesome things! There is ample parking and it’s free, and if you want to be a vendor check the website as the table prices are very inexpensive. This has been the summer of old school fabulous summer parties. 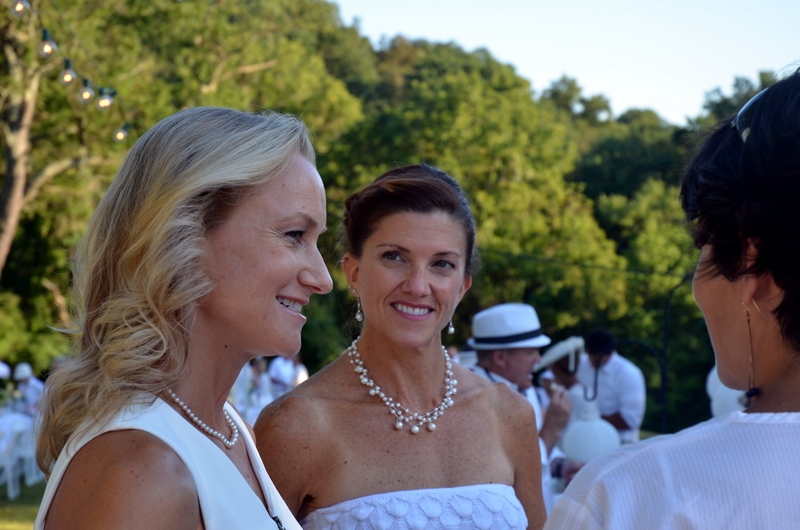 The summer began with Natural Lands Trust’s Stardust 2015 at Stroud Preserve and last Saturday it was capped off by the simply brilliant Brandywine in White at Chadds Peak Farm. Until this summer I thought the time of gracious and beautiful and FUN summer parties were the stuff memories of the past were made of. Not so! 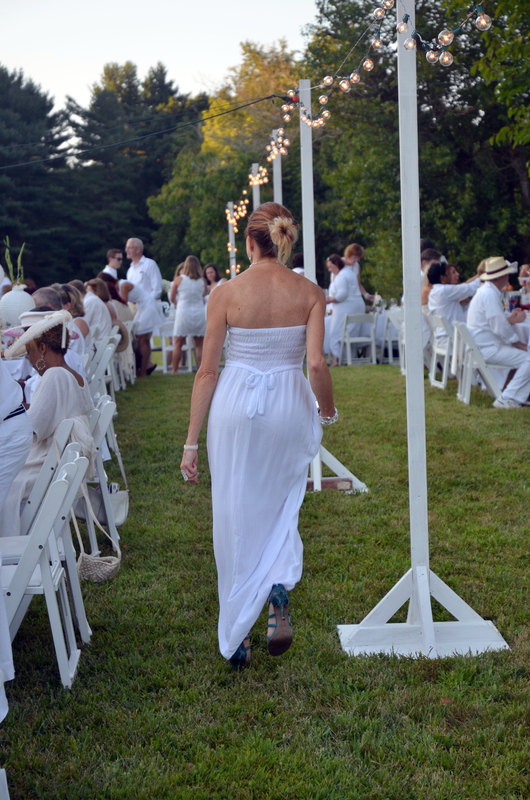 Brandywine in White was so sublimely civilized, we can’t wait for next year! 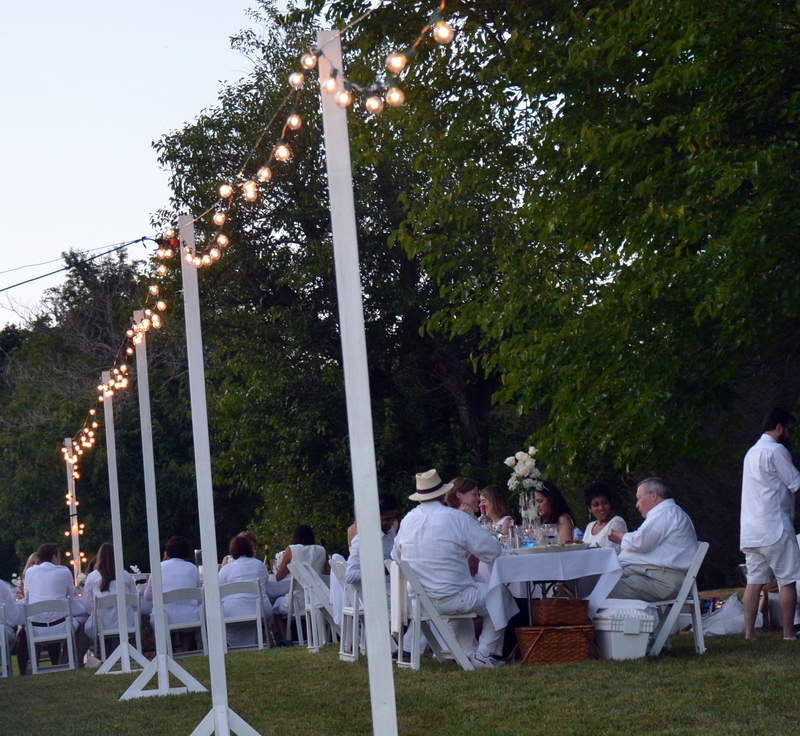 As opposed to Dîner en Blanc Philadelphia this is a more bucolic and intimate setting of about 200 people as opposed to the 4500 in Philadelphia. 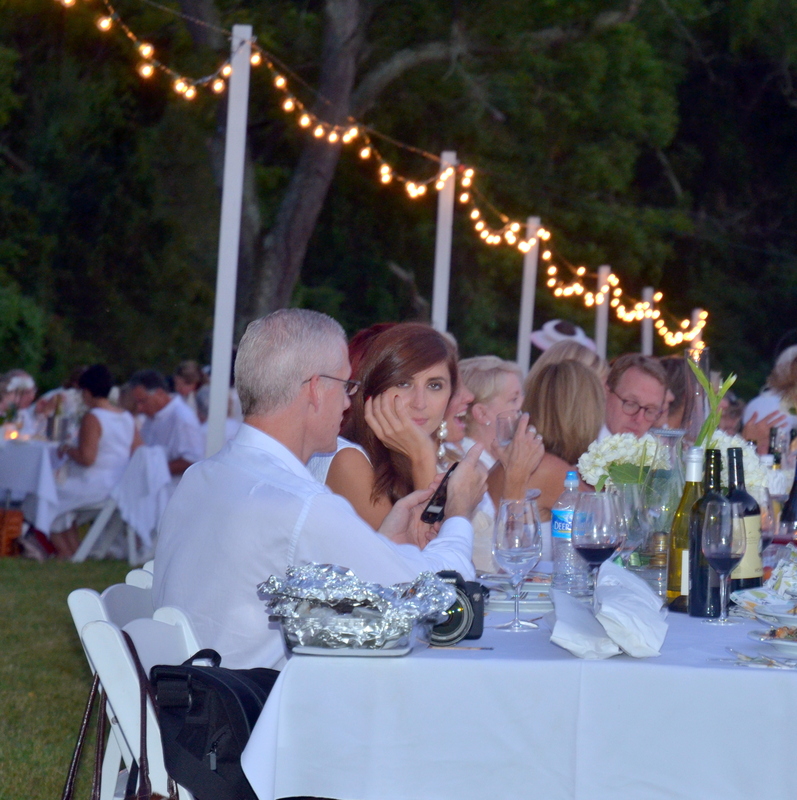 Brandywine in White reminds me of summer picnic dinners in England and Europe. It was just so lovely. A bunch of us purchased a table and a service table for our food and libations. 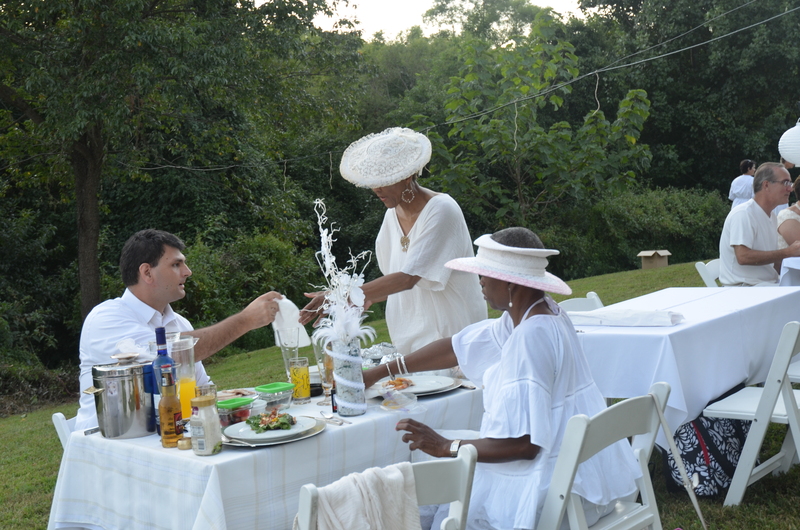 As opposed to Dîner en Blanc Philadelphia, at Brandywine in White you rent your table and chairs and you can also rent service tables. The tables come with white chairs and the tables have plain white tablecloths. 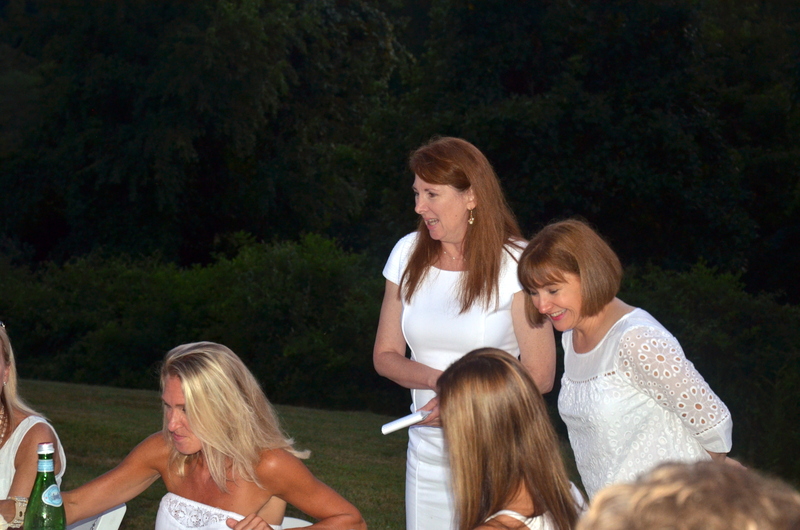 The guests bring additional white everything and food and wine. 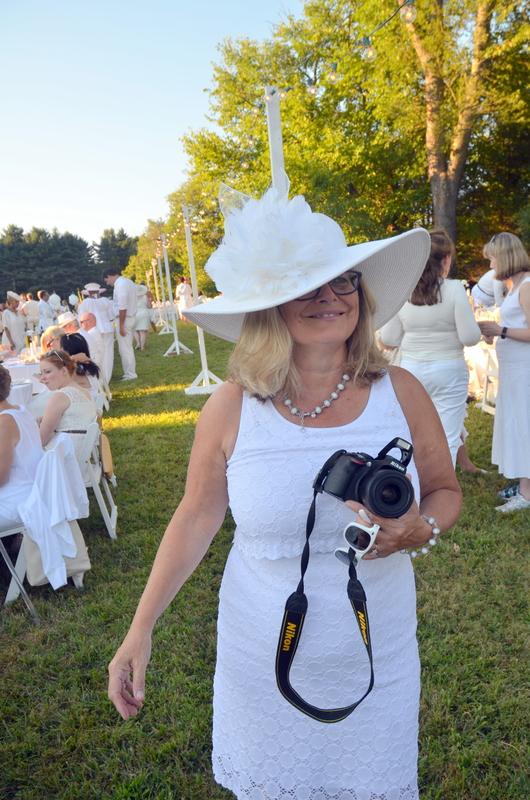 In the true en blanc tradition, guests wear all white, but at Brandwine in White you saw more ladylike and beautiful summer hats versus citified high fashion fascinators. I have to be honest I preferred the summer hats. 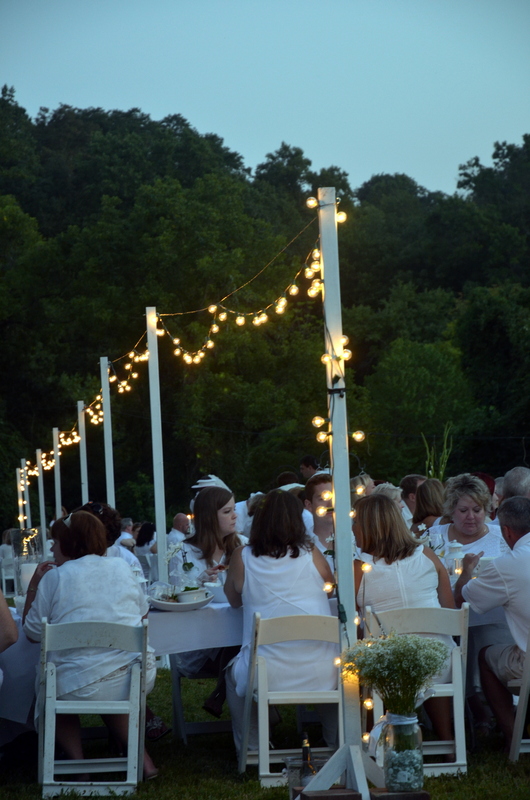 Guests traveled down an dirt road/driveway off the main road and as the trees parted to our right were beautiful fields and tables and people all in white. We were greeted at the entrance and checked in, and were pointed in the direction of a second event hostess who provided us with our table location. The tables were set up like a giant rectangle, but there was space in between each table for people to be able to move with ease. Down the center were white poles supporting clear white lights all over the party area. We set up next to a wonderful group of people and ended up trading some of our cheeses from iGourmet.com for some of their goodies including mushroom pinwheels. 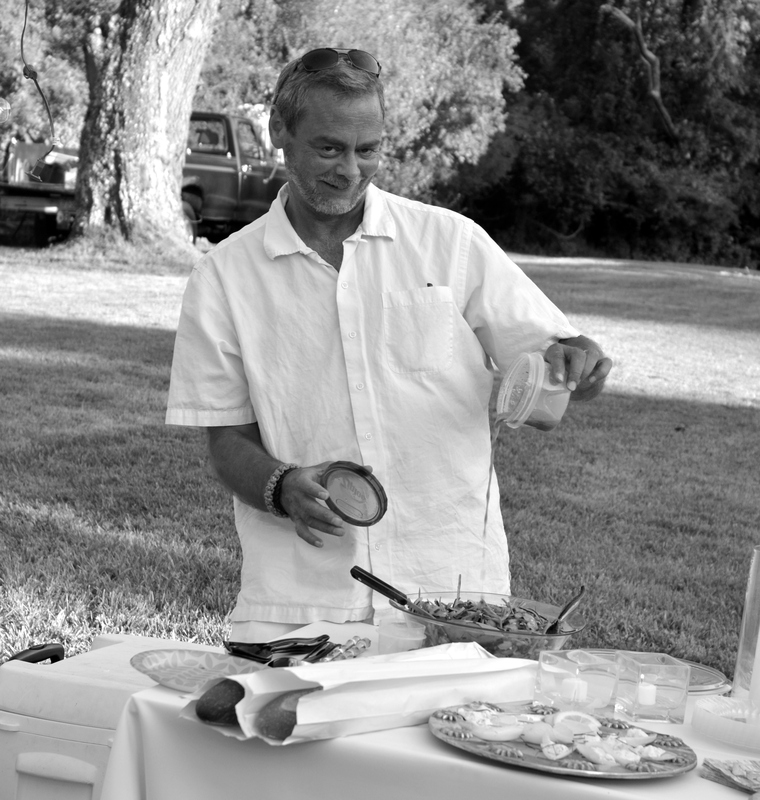 We served some luscious white wines and delightful French Rosé Wines with our picnic supper. We knew know on other than our table and we soon met many people we enjoyed so much. 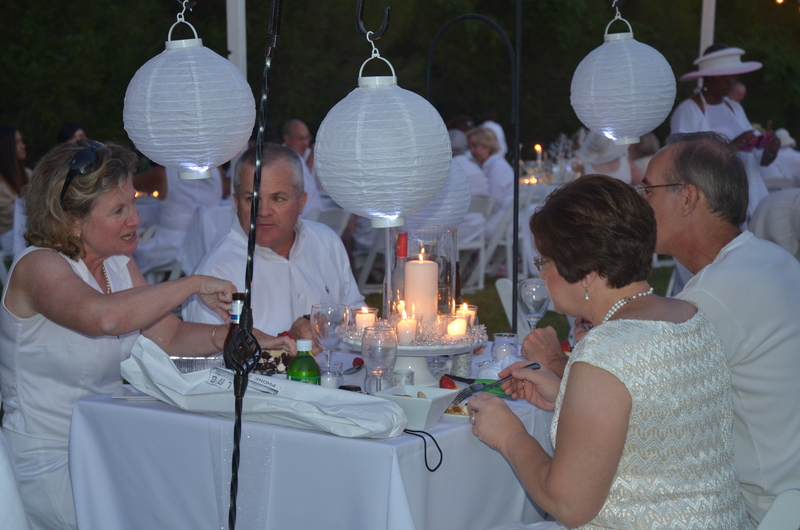 Brandywine in White guests floated from table to table visiting, snapping photos, and checking out the other white themed tablescapes. We were “vintage en blanc“. 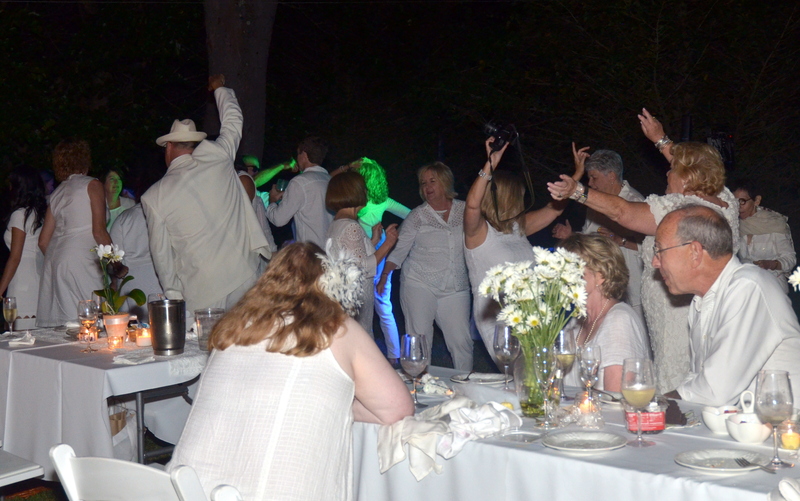 There was croquet and there was also dancing – and the disc jockey was the best one I had heard in years. no electric slide and overt personal commentary. He just played great music and lots of it! We are already planning ahead to next year! 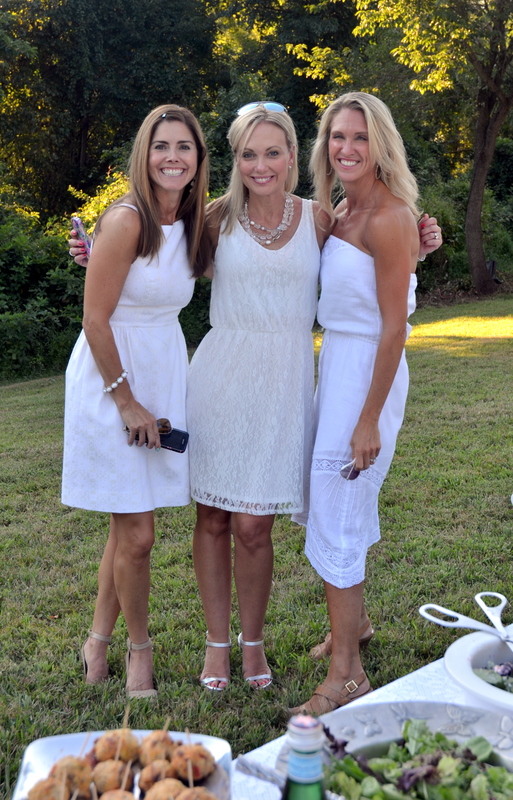 Brandywine in White was amazing and they gave donations after expenses to the Sunday Breakfast Mission in Wilmington which really needs a hand up right now. You see that lovely young woman? 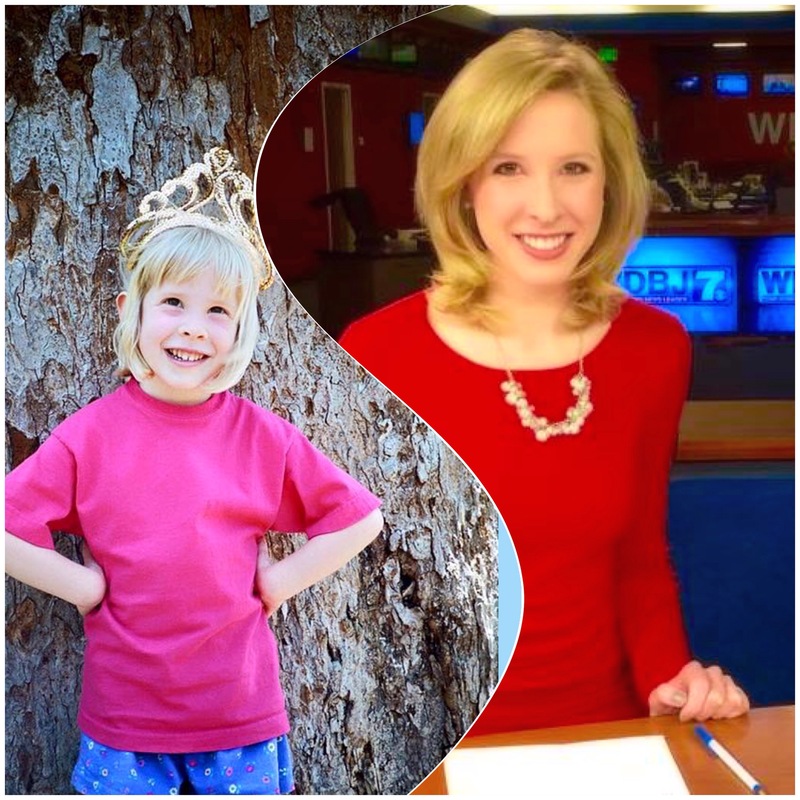 Her name was Alison Parker and this morning she and her cameraman Adam Ward were shot and killed near Roanoke, Virginia in a place called Moneta. She was 24 and was a graduate of James Madison University and he was 27 and a graduate of Virginia Tech. 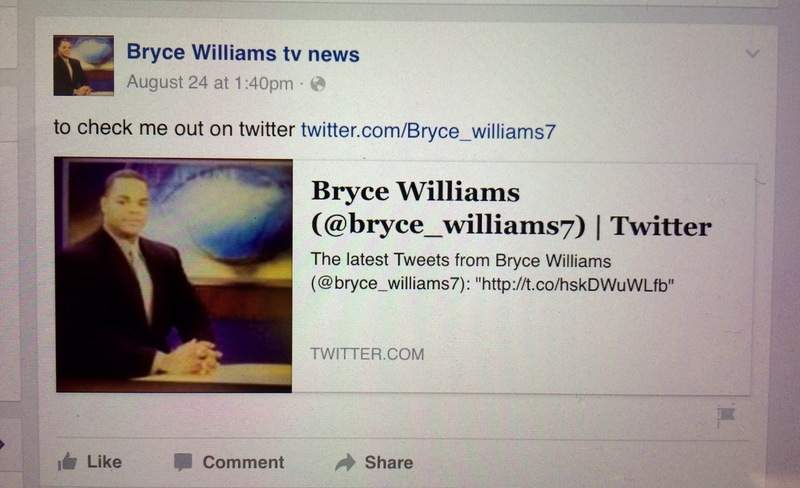 They were with Virgina CBS affiliate WDBJ7. They were killed in the middle of a live shot interview it looks like. This story is so horrific and I like many others didn’t know either Ms. Parker or Mr. Ward. For me personally it hits home because I have friends who are reporters and cameramen as well as newspaper reporters and newspaper photographers . I thought of them all immediately as this news broke. You think of them covering the news, not becoming the news and victims of violence. And even more horrible? It has been disclosed that the shooter was a former reporter, one of their own, who for a while put what he did on video on Twitter! They are reporting he is being chased through Virginia and other media reports say he may have committed suicide. This county is on full tilt crazy again. You can click on the links above to read about this horrific event. But before everyone goes into another endless gun control debate, remember what just happened here yesterday at the Chester County Courthouse, which made national news. Yesterday a guy named Curtis Smith of Coatesville went crazy with a knife inside our county courthouse, hurting people. He was shot and killed by Sheriff’s department personnel. As e dust began to settle we learned this guy had been arrested in Washington DC for scaling a wall of the White House. But seriously, this country is such a country of unpleasant extremes these days. When did we become a nation of violence? Sad day again for this country. We need to dial back the violence. Stoga grad sounds alarm on dog treats that choked and killed her puppy. I used to buy these treats. No more if the company can’t consider a shape change. 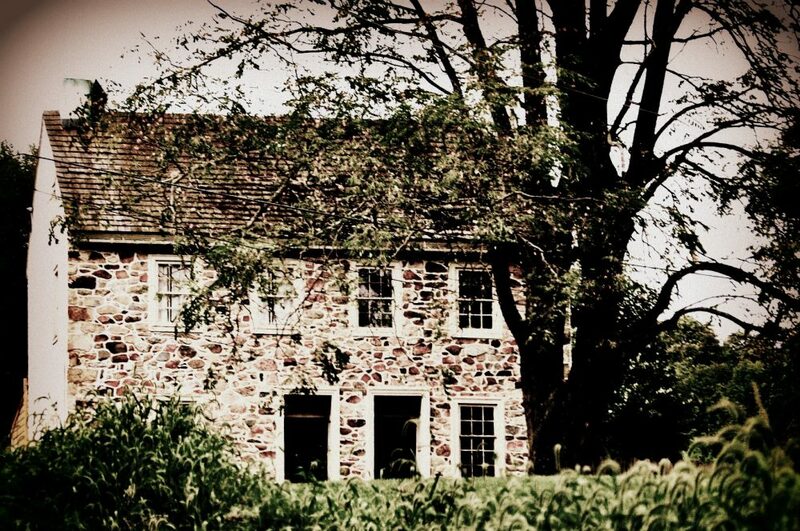 Photo from original savvymainline post. Please read entire post. 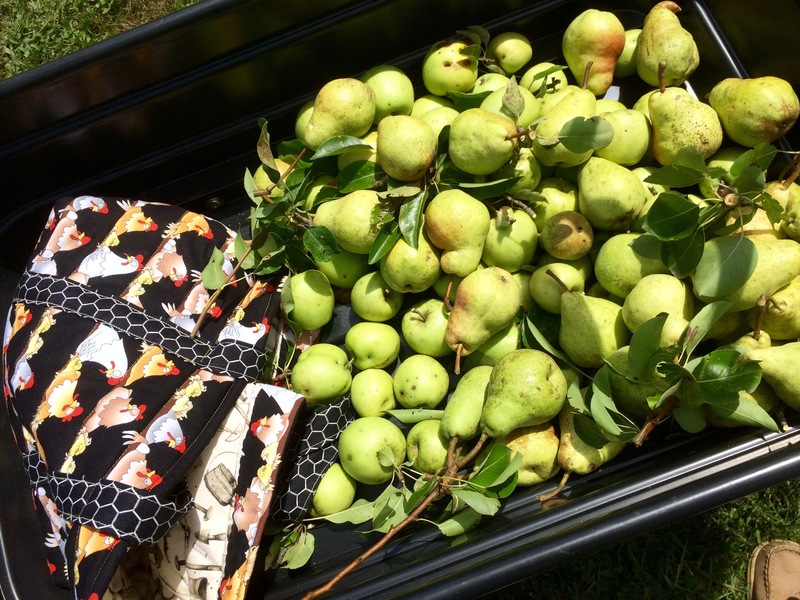 One of my awesome neighbors invited me to share the bounty of their fruit trees!